Bring power to all your computer components with the best power supply for your desktop PC. Compare prices, brands and online stores to find the perfect deal catered to your specific needs. A power supply unit or PSU is responsible for powering up your computer system via an electrical current. The PSU converts AC power (alternating current) into DC power (direct current) that can power the individual components found inside the computer case. The purpose of a power supply is not only to power the computer but also regulate direct current safely but also to prevent electrical spikes and power surges that may damage computer hardware. Computers need constant upkeep, whether it's purchasing larger hard drive capacities, more powerful graphics cards or faster CPUs higher voltage is usually required to keep up with your computers power demand. Most PSUs are rated by the number of watts it can generate; this means the more powerful your PSU, the more watts it can provide to your internal components. 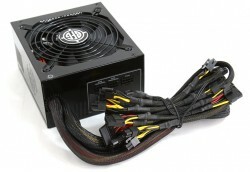 A power supply normally comes in different shapes and sizes called PSU form factors. Located at the back of your computers case, the PSU can also blows hot air from inside the computer case to the rear and out, keeping your computer's temperature to a minimum. Be sure to purchase addisional cooling especially if you plan to upgrade your computer with more powerful components. Today's desktop computers use ATX power supplies, the most common PSU voltage for an optimal computer is 500 Watts and higher. It's important to note that the computer case, motherboard and the power supply form factor has to be equally compatible to function correctly e.g. ATX motherboard in a ATX computer case powered by an ATX power supply. Be sure correctly install the PSU and fasten all screws tightly. NEVER attempt to open a power supply unit as PSU is not a serviceable component. Electricity may still run through the computer even after your switch it off so unplug the power cord from wall outlet for extra safety. When servicing your PSU or computer parts, always remove hand jewelry to prevent shocking. If you see smoke or smell burning from your computer case, shut down your PC immediately and unplug from the wall. Shopping for a power supply unit. A computer's internal hardware may require a high voltage as newer parts get installed, so with the decision of a new CPU or graphics card,the purchase of a new PSU with a higher wattage count can ease the load and prevent sudden shut downs or internal electric damage. OneShop has a range of great power supply units from recognizable brands like Cooler Master or Thermaltake as well as other reliable brand names. Expect latest information and up-to-date product ratings for the best PSU on the market when you decide on your next computer upgrade.